Leaving prayers at the center! Greetings everyone! 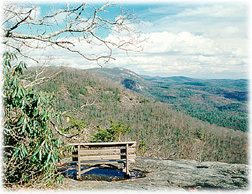 I am writing today’s blog from atop Little Scaly Mountain near Highlands North Carolina. I am acting as a chaperone for a group of church teens who are attending a Youth Conference at the Mountain Retreat and Learning Center. I had intended to blog on a Pilgrimage site in Daytona Beach yesterday, but sometimes life’s demands conspire against us. Meetings and preparation for this trip occupied my day and my chaperone duties occupied the entire evening. In addition, there is something about cold fresh mountain air that draws me into a state of deep sleep. I just left the “morning gathering” where the 100+ High School aged teens sang songs and prepared for a series of workshops that will occupy much of their day. I retreated to the “library” where the energy and noise levels are more conducive to my writing today’s blog. I am one of those people where the solitude and serenity of nature is a powerful influence on my spirituality. Nothing relaxes and inspires me like a walk through nature. The Mountain has been a special place of spiritual renewal for me since I first discovered it, on a church retreat, some sixteen years ago. I have acted as my church’s ambassador to the Mountain, given workshop and presentations for group retreats, accompanied church youth here for conferences, and most often just “dropped in” and stayed to hike, meditated, relax and create. The center is open to individual and groups of any faith or secular group. The mountain embraces diversity and promotes positive and just social change. The Mountain has been a place I have come to: let go of painful relationships, write poetry, find inspirational images for my artwork, sort out my life goals, relax while visiting various waterfalls, walking the surrounding mountains and the labyrinth and reconnecting with nature. One of my favorite stories was the time I visited during the winter. I arrived and the staff announced that they were all going away for three day. They left food in the Dining Hall fridge for me to eat. I spent two days and three nights alone on the mountain top. The serenity and sense of solitude, especially at night, as the wind blew and ice crystals danced in the noon light was profound. 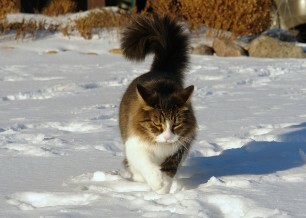 I ended up discovering that I was not entirely alone, as I found rabbit tracks in the fresh snow! The Labyrinth at the base of the mountain contains an alter stone at its center where people leave offerings and mementos. Among the items are two stones, one bears a painted yin-yang symbol the other the sacred Hindu symbol “Om.” On the bottom of each stone is the name of my sons. I have carried them with me in my thoughts and prayers as I walked this sacred path. I left each stone there that they might draw strength and serenity from these sacred mountains. Sunrise from the Fire Tower! I am breathing in and relishing that mountain spirit. I feel its presence refreshing and recharging my own spirit. But it is now time that return to “the throng” with its infectious teen energy and youthful joy. It is all part of the yin-yang dance of life! Have a wonderful day! I will return to our virtual journey and Daytona Beach tomorrow. Ain’t No Catholics in Blount County! As I ride the bike this morning I’m thinking about the pilgrimage site we are visiting today. 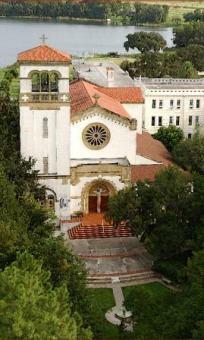 It’s the St. Leo Abby and Holy Name Monastery in St. Leo Florida. The site includes a monastery, a convent and an adjacent College. The site is manned by Benedictine monks and nuns. It overlooks a lake and offers beautiful grounds, including a grotto and college campus to walk, contemplate, pray and meditate. Like many of the retreat centers at the monasteries and convents, they offer the opportunity to spend the night and if you so desire, you can join the monks and nuns in their daily prayer and religious routines. This sentiment was driven home even more profoundly when three weeks later, as I and a new roommate were told to move a couple of counties to the west and resume our sales. As we pulled into the new town I asked him which church do you belong to and of course he reported: “I’m Catholic.” I’m not one to give up on an idea without trying it a few times, so I checked the local phonebook. Much to my surprise, there was a Catholic monastery on the outskirts of the town. We drove there and spoke with the monk in charge. For the next two weeks we stayed in a simple, austere room with a marginally comfortable bed. We ate with the monks who were a pleasant and cheerful group. One humorous aspect of the experience was that no alcohol was allowed in the county. Yet the monks brewed their own beer in the basement of the monastery. On Saturday night each monk would use his personal mug to enjoy a few “cool ones,” mixed with plenty of laughter. I didn’t realize at the time, but this experience with the monks in this beautifully tranquil setting would plant a very important seed that would blossom into my future spirituality. In the years to come, as I travelled the world in the US Navy, I would come to experience and recognize the power of a contemplative approach toward spirituality. I would find solitude in nature and through meditation and I would come to recognize the deep well of creativity and wisdom residing at the core of my being. Only now do I realize that this chance meeting with a Monastery full of monks presented me with a glimpse of a tranquil solitary path to a deeper level of understanding. The priests and nuns who had populated my experiences at the church schools I attended, while well meaning, seemed more like task masters and overlords than models and guides. It would be in the Hindu and Buddhist temples of the East that this seed would take root and I would find my first spiritual teachers and ultimately, my inner guide. As I have been conducting my search for pilgrimage sites and retreat centers I’ve come across many Catholic monasteries and convents. This makes sense given that the church has long recognized the importance of the inward focused, often solitary contemplative approach to spiritual journeys. During the dark ages in Europe it would be the monasteries and convents that were often the repository for knowledge where books were copied and housed. These facilities were often located in remote and isolated places to lessen the distractions of the world allowing for the residents’ endeavors to connect with the divine (mystically) or receive revelation through studies of the sacred scriptures. Given these feelings, you can perhaps understand why I was “taken back” when my Google search of “contemplative spirituality” produced 10 references that all presented a negative view of the practice. 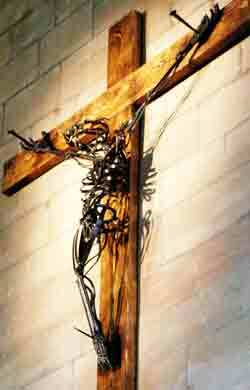 It was described as wrong, evil, non-Christian and as a highly suspect movement towards mysticism. They specifically mention problems with the use of labyrinths, promoting pagan rituals, and of meditation, not involving the sacred scriptures. In my last posting I spoke about the levels of analysis one can use when examining examples of religious behavior. We can use a form/substance level of analysis or we can analyze it on the functional level. As I look at this criticism directed toward contemplative spirituality I see that all 10 of the references make use of the form/substance level of analysis. They do not believe the contemplative approach fits what they define as the “true religion.” It doesn’t quote the “correct” sacred scripture or make reference to a valid source of truth in their view. I take a functional approach toward this issue. 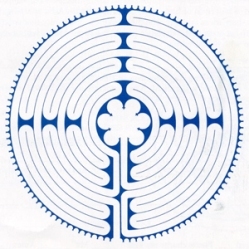 When I see people walking a labyrinth, sitting in quiet prayer or meditation, writing a poem, creating an artwork, or walking quietly along a river, I recognize all of these as functioning as forms of prayer. All can represent forms of connectedness with parts of themselves, with the world about them, and with something greater than ourselves. I point out to my students that the theory we use to make sense of the world can have significant consequences for ourselves and others around us. If you use a form and substance analysis you often label behaviors and rituals as true or false, or right and wrong. If you take a functional approach you often end up seeing many diverse behaviors and rituals as meeting the same function for different individuals or groups and that’s OK. Just as the world is made up of people with different tastes for food, different preferences for cars, and different ideas about politics so too the world is made up of people who experience the divine and connect with the divine in different ways and that’s OK! 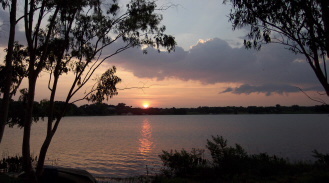 Sunset at the Abby lake! If you would like to visit the Abby’s webpage please click on the Pilgrimage Site tab at the top of this posting.